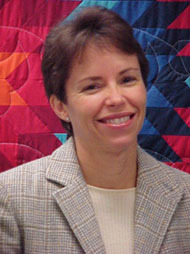 Director of the Creighton Center for Service and Justice, a department of University Ministry, since 1998. Born in Havana, Cuba of parents formed and informed by Jesuit education and Ignatian Spirituality, I was raised in Milwaukee, Wisconsin where my father found work in exile. I graduated from Marquette University and Barry University/SouthEast Pastoral Institute in Miami Shores with degrees in Theology and Religious Studies/Hispanic Ministry. After 20 years in Hispanic Ministry in Detroit, Milwaukee and the farm worker community of Immolakee, Florida, I came to Creighton University in 1998 to direct the Center for Service and Justice. I am married to a great man of faith and dedication to God’s people as a drug and alcohol counselor and social work adjunct professor at Creighton, John Witchger. Our three adolescent sons, Felipe, Martin and Luke keep life ever-adventurous and amazing. I am grateful for the invitation to slow down and tip the balance more in the contemplation direction, to draw deeply from the well of richness in Scripture and to take the opportunity to clarify thoughts about my faith and life through writing.